1 Whisk the egg whites until stiff, then set aside. 2 Whisk the egg yolks with the sugar until pale and thick then beat in the mascarpone. Gently fold the whites into the mascarpone mixture with a large metal spoon. 3 Pour the coffee, marsala and brandy into a shallow dish. Dip one-third of the sponge fingers completely into the liquid for 1-2 seconds. Then arrange them on the base of a shallow glass serving dish. 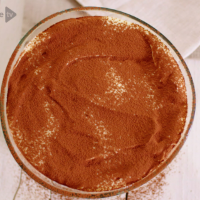 Spoon a third of the mascarpone mixture on top, followed by 1 tsp of sieved cocoa powder. Repeat the layers, of soaked sponge fingers, mascarpone and cocoa, finishing with a layer of mascarpone. 4 Cover and chill overnight. Dust with cocoa powder before serving. Egg warning: because this dish contains uncooked eggs, it is not suitable for very young children, pregnant women, elderly people and anyone whose immune system is weak.